This dress is the perfect combination of sweet/innocent and alluring. The Maegan Floral Lace Open Back Fitted Dress is made of floral lace and is lined below the bust but the shoulder straps and top back are semi-sheer. It features a great fitted cut and open back detail. The Maegan Floral Lace Open Back Fitted Dress would look great paired with pumps for your next night out! Please note: Although this dress is lined, it is a bit sheer; you may want to wear a slip or cami underneath. Details: Lined. Made in USA. 61% rayon, 34% nylon, 5% spandex. Hand wash cold. Do not bleach. Hang to dry. Small measurements: Length from top of shoulder to hemline: 34”. Bust: 34”. You have added Maegan Floral Lace Open Back Fitted Dress in Black into Wishlist. You have added Maegan Floral Lace Open Back Fitted Dress in Black for Stock Notification. You have set Maegan Floral Lace Open Back Fitted Dress in Black as a loved product. 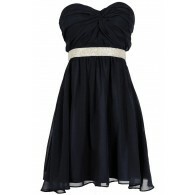 You have removed Maegan Floral Lace Open Back Fitted Dress in Black as a loved product.